Avène High Protection 50+ Ultra-Light Mineral Lotion - 50ml - $28- great for the face, it layers invisibly under makeup. 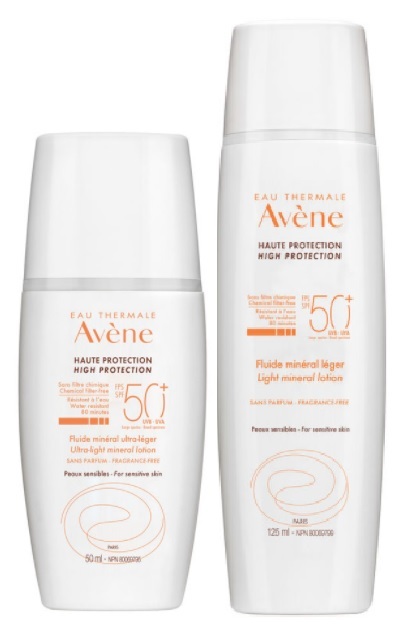 Avène High Protection SPF 50+ Light Mineral Lotion - 125ml - $35 - perfect for body - or face if you like a slightly thicker texture then the ultra-light formula. Both feature a formula free of chemical filters, fragrance, paraben and oil - with an extremely lightweight texture that goes on sheer with no white marks, is water resistant for up to 80 minutes and offers long lasting hydration as well as providing broad spectrum UVA/UVB SPF 50+ protection from titanium dioxide and zinc oxide, powerful anti-oxidant protection from pre-tocopheryl, a photostable form of vitamin E and contains Avène Thermal Spring Water - to soothe and soften the skin.